The Chicago area’s wastewater treatment agency says it’s ahead of schedule in its efforts to combat climate change, having decreased greenhouse gas emissions at its treatment plants by more than 30 percent since 2005. The Metropolitan Water Reclamation District of Greater Chicago says infrastructure upgrades will eventually allow the agency to cut greenhouse gas emissions by 50 percent, also relative to 2005 levels. MWRD spokesperson Allison Fore said the agency does not have a timeline for reaching the 50-percent goal. The reductions are projected to lower the agency’s carbon footprint by up to 172,000 metric tons of carbon dioxide, equivalent to nearly 20 million gallons of gas consumed, according to the U.S. Environmental Protection Agency’s Greenhouse Gas Equivalencies Calculator. MWRD’s announcement comes amid a flurry of climate change-related news, both nationally and in Illinois. A group of prominent Democratic lawmakers on Thursday unveiled a plan – which is being called the “Green New Deal” – to transform the U.S. economy by creating thousands of renewable energy jobs. On Wednesday, Democratic state Rep. Will Davis of south suburban Hazel Crest announced his plan to introduce legislation aimed at significantly expanding Illinois’ wind and solar energy capacity. And last month, new Gov. J.B. Pritzker signed an executive order adding Illinois to a coalition of states that say they’re committed to reducing greenhouse gas emissions consistent with targets set in the landmark 2015 Paris climate agreement. After President Donald Trump announced his intention to withdraw the U.S. from the deal in 2017, MWRD’s Board of Commissioners passed a resolution to honor the Paris agreement by meeting goals outlined in the deal. In initially signing the agreement under former President Barack Obama, the U.S. had set a target of reducing emissions by 26 percent to 28 percent by 2025, based on 2005 levels. “It is critically important for us to examine potential sources of renewable energy, find ways to reduce our carbon footprint and recover valuable raw materials as we work toward a goal of addressing climate change and improving our water environment,” said MWRD President Kari Steele in a statement. 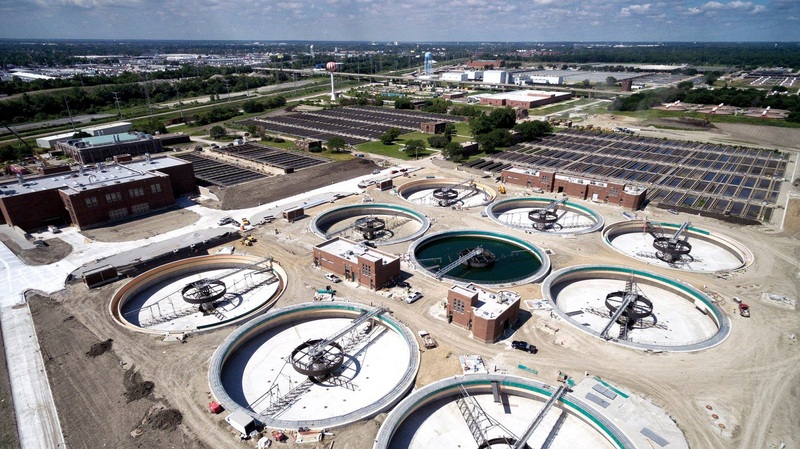 To reduce its energy consumption, MWRD has implemented alternative energy sources and decommissioned 36 outdated sewage tanks at its Stickney Water Reclamation Plant. The tanks are being replaced with 15 new tanks the agency says will lower its carbon footprint and alleviate odor issues associated with the wastewater treatment process. The new equipment will also result in less nitrous oxide – a greenhouse gas – discharged into area waterways, according to the agency. MWRD also attributes its emissions reductions to 56,000 oak tree saplings planted by the agency throughout Cook County to help soak up stormwater and capture carbon dioxide. “By meeting greenhouse gas emission goals well ahead of the Paris Agreement goals for 2025, the MWRD is leading the fight to save our planet while making Cook County a quality place to live,” said MWRD Commissioner Kimberly Du Buclet in a statement.